This psalm's little prologue : "A contemplation of David when the Ziphites went and said to Saul, 'Is David not hiding with us?' " helps us place it in a story. David is fleeing from King Saul, his father-in-law who is insanely jealous of his popularity and wants to kill him. David has so far been able to trust the territory-savvy locals to keep quiet about where he's hiding. But the Ziphites are different. Members of this desert tribe go to Saul at Gibeah, tell him they know where David is, and promise to lead Saul to him. 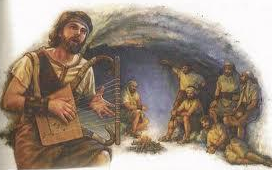 Delighted, Saul and his men are soon hot on David's trail. Second Samuel 23:19-28 gives us his location: "… strongholds in the woods in the hill of Hachilah … in the Wilderness of Maon." We get the picture of Saul and his men creeping ever closer: "Then Saul went on one side of the mountain, and David and his men on the other side of the mountain …Saul and his men were encircling David and his men to take them." The 2 Samuel 23 context of this psalm tells us another little story too. Before Saul and his men pursue David into the wilds, Saul's son (David's best friend) also pays him a visit. What a contrast. Jonathan easily finds him and we read that Jonathan "… strengthened his hand in God." He encourages his friend David for the future: "… you shall be king in Israel…" and they renew their loyalty to each other in a convenant - 2 Samuel 23:16-18. Perhaps David shouldn't be surprised, then, that after this up time, his faith is tested. And so with Saul and his army every moment tightening the noose, David vents: "Save me O God by Your name; / And vindicate me by Your strength…" Psalm 54:1. My guess is that David writes this psalm in stages. For the story isn't over. When all looks lost and capture inevitable, God intervenes: "But a messenger came to Saul, saying, 'Hurry and come, for the Philistines have invaded the land' " 2 Samuel 23:27. And with that Saul and his men are gone. So David finishes his psalm with "I will freely sacrifice to you; / I will praise Your name, O Lord for it is good" - Psalm 54:6,7. I see a couple of life lessons in this psalm and its context story. God can come through for us, right on time and in ways we never imagined. And He can do it without any manipulation or help from us. So if you're in a Psalm 54 place today, follow David's example of leaning on God as Your helper, and look forward to what He will do. PRAYER: Dear God, thank You that no situation can get the better of You. Help me to trust You when trouble presses in (and when things are good too). Amen.